Preheat the oven to 350 degrees and line two muffin tins with 24 cupcake liners. Drain the marachino cherries and reserve the juice. Chop the cherries with a sharp knife. In a large bowl beat the butter and sugar together until light and fluffy (stand mixer or hand mixer work great here), this should take 3-5 minutes. Add the egg whites one at a time, beating well after each ones. Add the vanilla and almond extracts and stir to combine. In a medium bowl add the flour, baking soda, baking powder, and salt. Whisk together. In a small bowl combine the buttermilk and 2 tablespoons of the reserved maraschino cherry juice. Add 1/3 of the flour to the sugar mixture and stir to combine. Add 1/2 of the buttermilk mixture to the sugar mixture and stir to combine. Repeat with another 1/3 of the flour, and then the rest of the buttermilk mixture, and finish with the last 1/3 of the flour, mixing after each addition. Stir in the chopped cherries. Put 1/3 of a cup of the batter into the prepared muffin cups. Bake for 12-15 minutes until the cake is done. You’ll know that they are done when you press lightly on the top and the cake springs back (no indent is left) or a toothpick inserted into the center comes out clean. When they are done let the cupcakes cool in the pan for 5 minutes and then remove them onto a wire rack and let them cool completely before frosting. Add all of the icing ingredient to the bowl of your stand mixer (with the whisk attachment on). Mix on low until the ingredients start to come together and then increase the speed to high. Mix on high for 4 to 5 minutes until the icing is light and fluffy. 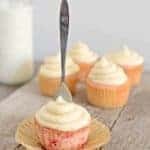 Place the icing in a pastry bag with an 2A tip and pipe onto cooled cupcakes. Enjoy now or store any leftovers in an airtight container. The icing consistency is important… you can find some tips on what you are looking for and how to achieve that texture/consistency here.